Just a way for me to show my editorial skillzzzz. And chops. Welcome back everybody to another awesome installment of Editorial Edits! This week I want to talk about something a little different, I want to talk about advertising in comics. Why? Well I think that advertising in comics presents an interesting problem for artists and editors, they have to plan stories around these immersion-breaking 3rd party pages, and this is accomplished different ways by different publishers. So without further ado, let’s get cracking! If you’re like me, you probably don’t even really notice the ads in your comics anymore. I give them maybe a cursory glance, say no more than a second unless it’s something interesting, and then continue on with my story. The only time it’s a problem is when it significantly impedes the flow of the story or the ad is in direct opposition to the emotional impact of the page. There have been times when advertising has completely ruined some pivotal event in a story. The comic builds up to this awesome emotional climax and when you turn the page the first thing you see is a Skechers ad. Uncool. Really I wonder how much power editors have over where to place ads? Obviously they want to put them in spots where they’ll have the least impact on the narrative, which might mean that readers, not so engrossed in the story, may actually take more time to look at them. Oh man, this just got so much more complex! 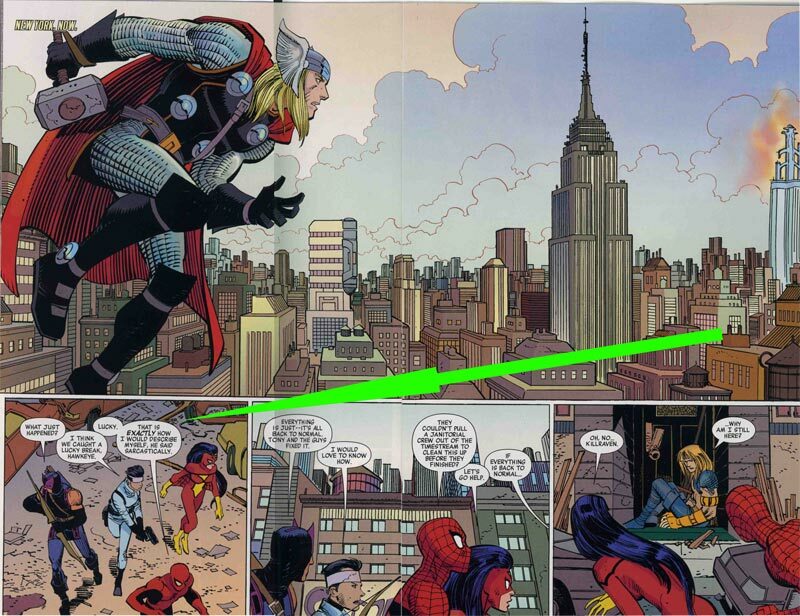 Ok so let’s take quick look at the the amount and placement of ads in some recent comics. I only have access to a sample of my collection here at school but it should suffice to get an idea of how different publishers handle advertising. I’ve got eight books here and I looked at title, price, publisher, # of comic pages, and # of ad pages. I did not count the front and back covers as advertising, nor did I count letters from creators. I did count corporate newsletters as ads. 25 pages of ads, almost all at the end and are made to be a part of the comic as a prelude to other comics spinning out of the event. So what’s interesting about this little snippet of the recent releases (and not so recent with Fear Itself)? Well firstly publishers use advertising differently. 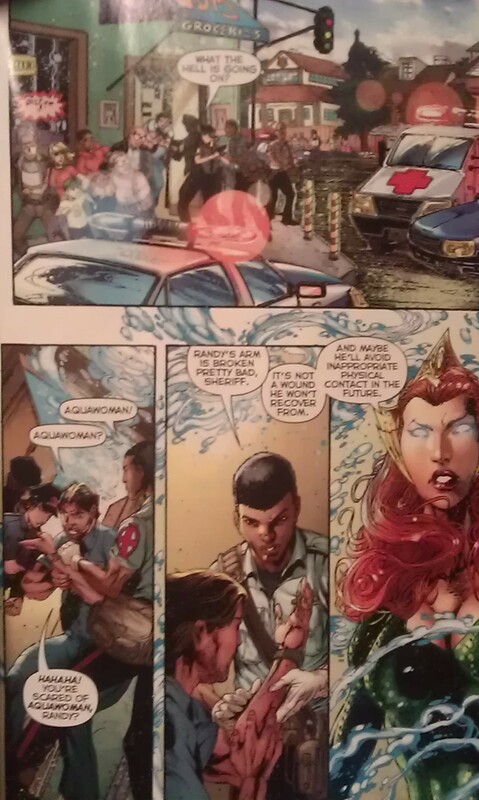 Marvel and DC sprinkle advertising throughout their monthly books. 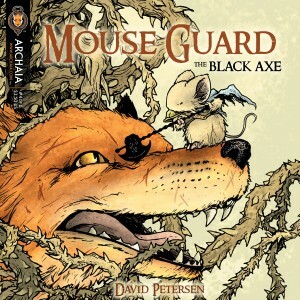 The smaller publishers (in this example Archaia, IDW, Image) usually place advertising at the end so that it doesn’t interfere with the story. Obviously in those cases editors and creators don’t have to worry about ads interrupting their narratives. What’s really interesting is that Marvel doesn’t always follow one prescribed formula. Take their Dark Tower adaptation, not a single ad to be found! Whether that has to do with Stephen King or some crazy licensing agreements I don’t know, but I definitely appreciate the ad-free experience! 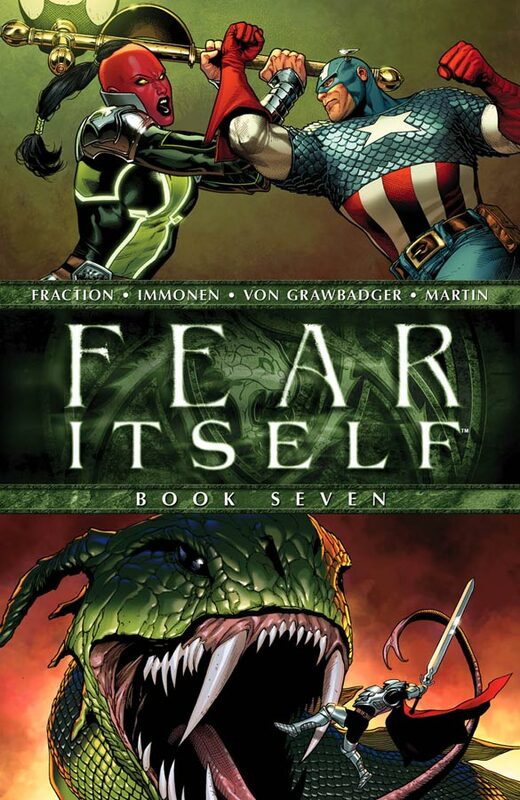 We also have our special Fear Itself event, which had very little advertising in the story proper, I think there were only 2 within the 40 page conclusion, and then 23 pages of “comic,” advertising books spinning out of the event. I can only assume that the editors didn’t want to interrupt this awesome finale and decided to keep the advertising to a minimum throughout the tale. Right now I’m not quite prepared to carry out a detailed analysis of advertising in comics, I’d really like to, but alas I just don’t have the time. What I would like to say is that it seems like editors from the Big Two probably have to account for advertising interrupting the narrative. The real question is how does that affect the composition of the stories? How do they decide when are where to put the advertising to lessen its impact? All questions for another day! 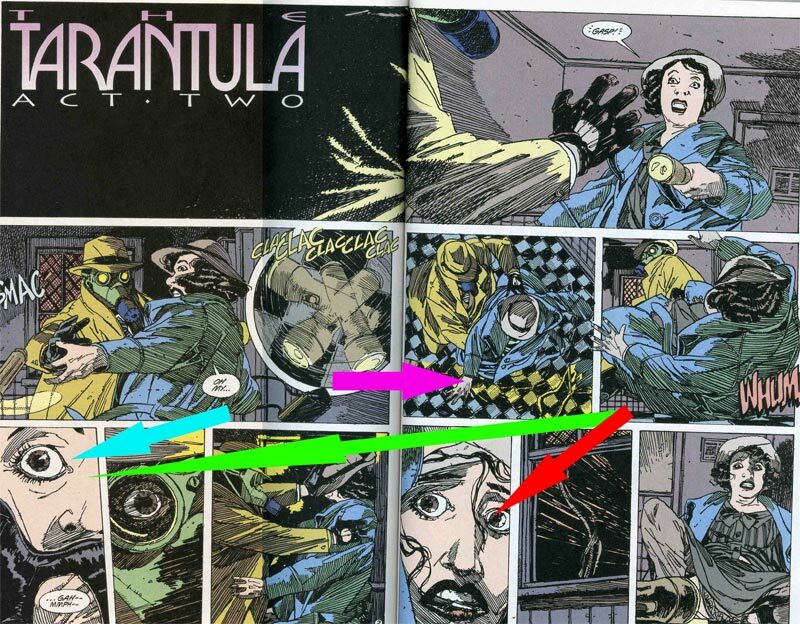 This week in Editorial Edits I want to talk about something that we don’t see very often in comics: changing the page orientation from horizontal to vertical. Again this particular trick isn’t used all that frequently (though I did just see it in Infinite Vacation #4), but it’s still an interesting artistic move that I think has both strengths and weaknesses that drastically influence both the narrative and the reader’s level of immersion. My favorite example of this type of transition comes from Alan Moore’s Swamp Thing #34. Here Abby has consumed a piece of fruit from Swamp Thing’s body. It contains a fraction of his elemental consciousness and opens Abby’s mind to the astounding interplay of energy, life, and death in the natural world. Moore and co. invite us to join Abby on her psychotropic journey. Notice how panels two, three, four, and five gently guide the reader into this new vertical orientation? It’s subtle but calculated, mirroring what Abby herself is going through as the fruit does its work. 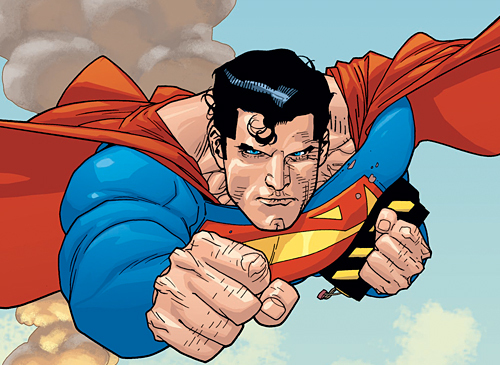 Huge vertical panels follow, depicting images that simply wouldn’t work in the standard comics format. But more than that, it serves to take us deeper into Abby’s trip in the heart of the swamp. The narrative strangeness for the character becomes physical strangeness for the readers. What’s even more awesome is that Moore, Bissette, and Totleben guide us back to reality, back to the standard comic format, the same way we started, a subtle, gradual, but calculated return to normalcy for both Abby and the reader. 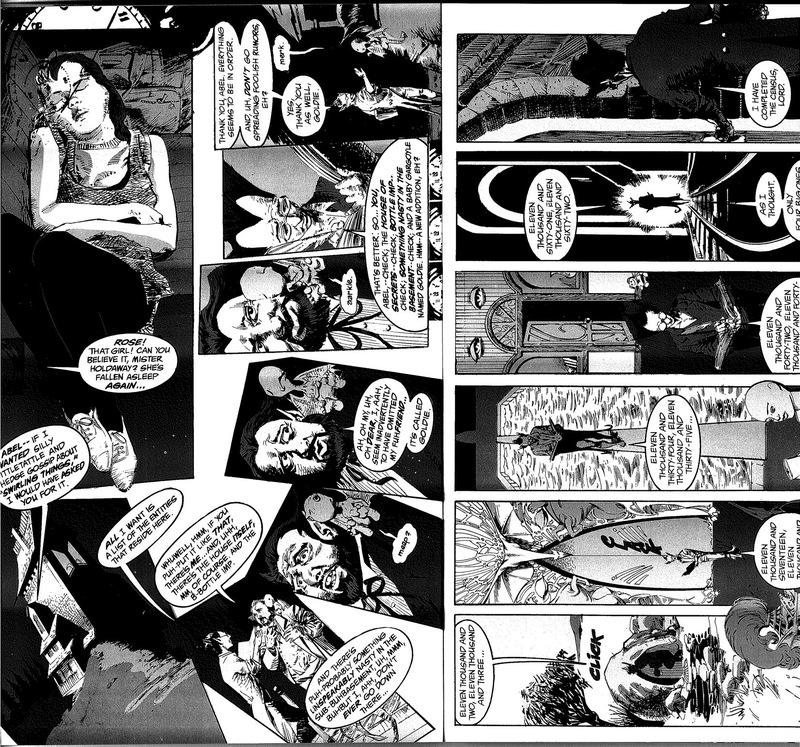 Next we have a spread from Neil Gaiman’s The Sandman #10. Check it out. Here Gaiman transports this young lady to the Dreaming, where she meet Cain and Abel and their Houses of Mysteries and Secrets. 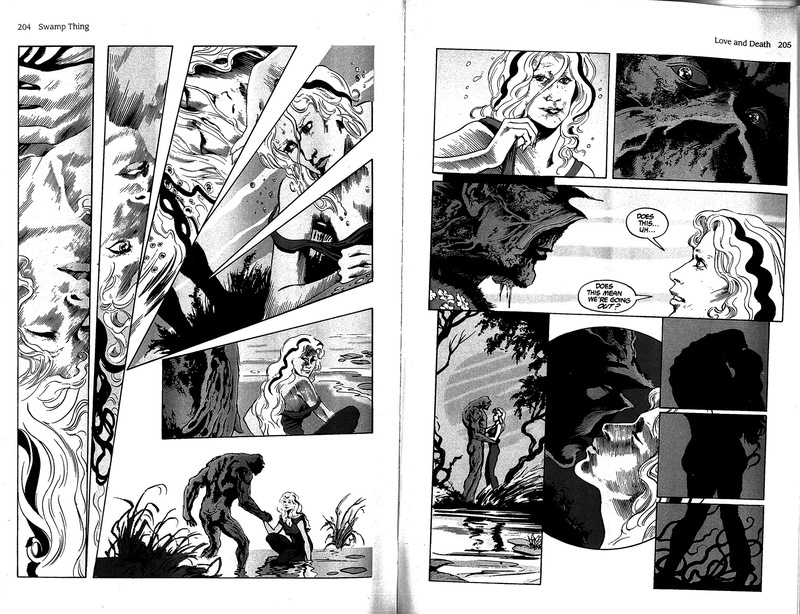 The second, third, and fourth panels work the same way as in the Swamp Thing example, gently guiding the reader to the new orientation, which again leads to some brilliant spreads that make the citadel of Morpheous seem even more hauntingly beautiful and grandiose. I didn’t have a chance to scan the pages where the young lady awakens, but it’s just one small narration box that says something like, “Wake up dear, we’re here.” The box is written as though the comic were being read normally, so the reader has to switch back to the standard format to read it comfortably, and when they flip the page they’re suddenly transported back to the waking world, just as if they’d been rudely awoken from a dream. I think the strength of these transitions comes from forcing the reader to physically reorient themselves as the character goes through their change. There’s a deeper connectedness inherent there that maybe we don’t even notice. That and the vertical pages allow for some totally awesome images that you couldn’t do normally. It allows for higher vistas, towering scenes only limited by the artists’ imagination. I think that the major weaknesses of this method come from the physical turning of the book as well. Regardless of how well you guide the reader into the change they’re still going to be flipping the comic, not just turning a page. 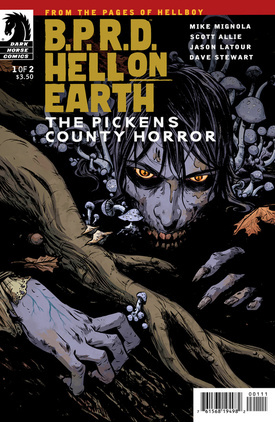 That’s new and different, so while it may mirror the narrative, it’s strange and unfamiliar and if not done well, it absolutely kills the immersion and all you’ve done is reminded your reader that they are in fact, reading a comic book. I wish I had a good example of an occasion where it’s not done well, but there were some X-Men comics from the 90’s that have you reading along normally and then BOOM, no buffer, no sign whatsoever indicating that we might go vertical and then you turn the page and you have to turn the book. I remember the first time it happened and I was just… I was just so annoyed. There was no reason for this to happen, one minute characters are talking to each other, the next they’re doing it rotated 90 degrees to the right. That’s doing it wrong, when there’s simply no reason for it to happen. I think if the horizontal to vertical transitions is done well it can lead to one of the most gratifying experiences in comics, but even so it will always cause a break in the narrative. 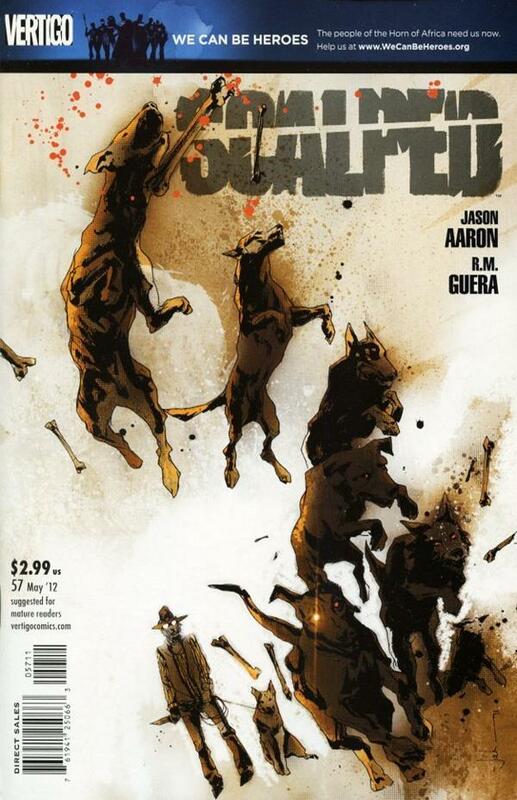 The sheer strangeness of actually flipping the comic pulls the reader out of the story and back into the real world. The change must be facilitated with grace and subtlety to achieve its full potential. Also, it must fit the story! 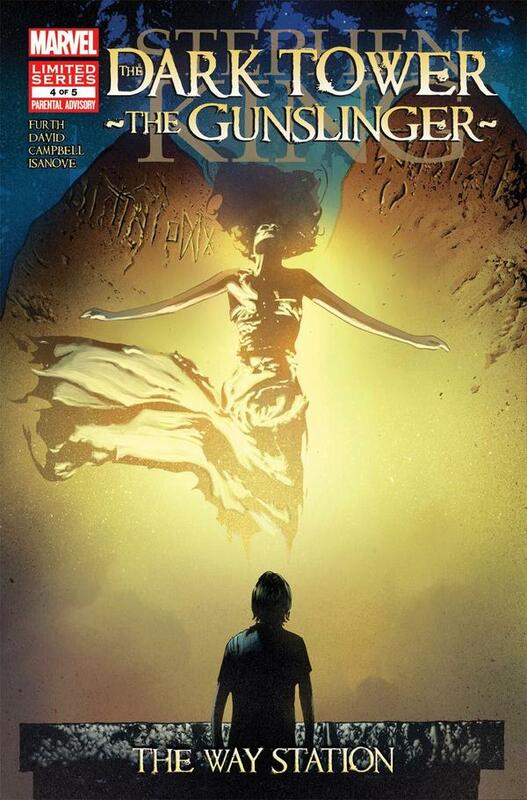 Swamp Thing and Sandman are two titles rife with the supernatural and are no strangers to odd twists of perspective. Weird things happen and I think these types of transitions work well simply from a genre perspective. That’s not to say it can’t be used elsewhere, but it has to be done for a reason and done right. Here at good ol’ MSU everyone is recovering from their undoubtedly awesome Spring Break shenanigans. Me? Well my girlfriend and I went down to visit my best friend and his wife and spent 4 days in a lake house in South Carolina. It was a blast, but we’re not here to talk about the copious amount of beer I drank or the number of Yahtzees I rolled (3), not even how much I owned in Clash of Heroes. No, we’re here to talk about comics, and more specifically, Editorial Edits! 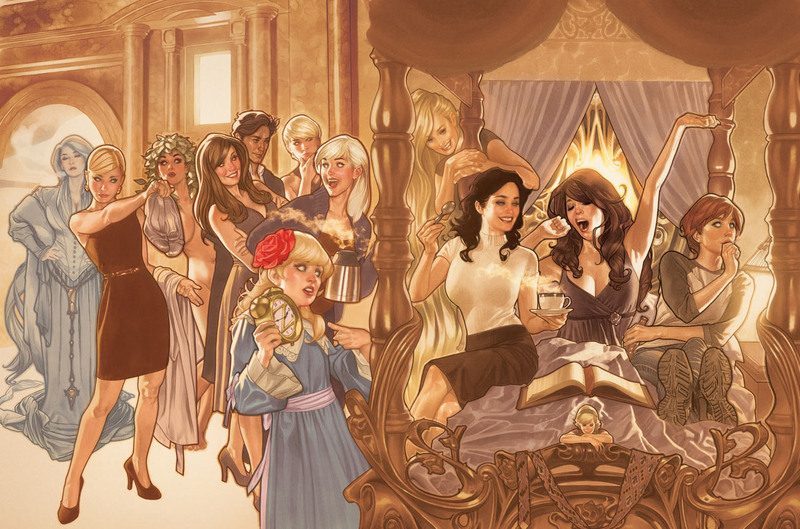 Fables is quite honestly the most solid comic that I get each month, hands down. I’m always excited when I see it on the shelf, a feeling that’s unfortunately passingly rare these days. In this issue we follow Ali Baba, the Prince of Thieves as he attempts to find a way home after the Fabletown War. He finds a fancy bottle and, well I bet you can guess what happens next. Let’s take a look at the page in question shall we? There’s no previous page that directly leads to this one here – What you see is what you get. Can you spot a problem? Is there a little hiccup here? BTW totally property of DC Comics. What do you think? Did you spot anything that comes off as a bit unwieldy? My personal problem is with the first 5 panels. Here we have Ali Baba running away from something, and in the second panel it’s revealed to be a big terrible beasty. Here I was initially confused by the depth of the image. 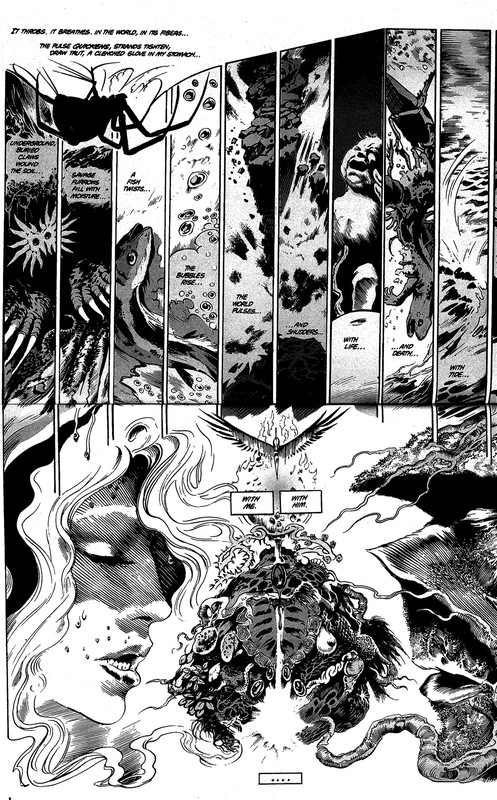 If you look at Ali Baba in the first panel he’s much higher up on the “ground” (indicating he’s farther away from the panel), while in the second panel the demon creature’s foot is almost flush with the bottom border. Initially I thought that the monster was part of a stampede, but the third panel I think reveals that’s not the case. Then in the fourth panel Ali Baba is back down off the high ground, much closer to the bottom of the panel and it sorta looks like he’s still running straight, which seems a bit strange considering that would mean now he’s chasing the monster that was chasing him! Finally in the fifth panel we get a close up of Ali Baba, who I assume is still running, and then in the sixth the creature is somehow magically behind him again. Upon my first read through this was my imagined sequence of events: 1) Ali Baba running from something, 2) Maybe running from stampede of weird beasts, 3) Hurdling a beast, wait he’s probably running from that thing, 4) Why are you still running? However, upon closer inspection I think what happens is that in the fourth panel Ali Baba stops running after hurdling the monster and that the fifth panel is meant to show him taking off in another direction, possibly to his right, or straight at the reader, as indicated by the closeup. PHEW!!! Does that make sense? I think that my own misunderstanding of this sequence arose between the fourth and fifth panels. I thought that Ali Baba was still running straight, because even though now it looks more like he’s coming to a stop, the disappearance of his rear leg kinda threw me off a little. Then we have a closeup of Ali Baba. This is the problem, the closeup doesn’t indicate any change of direction. Did he start running a different way? Who can say? I thought that maybe the camera had just panned to in front of the thief and he kept running. Imagine my surprise when the beast was suddenly behind him again! What do you guys think? Did you come across any issues while reading this page? If I were editor and I felt the same confusion while looking over the page I think first I just would have asked a question: What’s supposed to be happening here? As an editor, as that first reader, I don’t want to assume anything. Assuming is bad. If he did start running another way, I might have suggested that the fifth panel possibly zoom out and show the beast scrabbling to turn itself around and continue the chase. I honestly think that’s all it would have taken. Ok… So I think that’s that! Again, when it comes to the Editorial Edits series I’m not trying to throw anyone under a bus or call out anyone in a mean or disrespectful way. I think as artists and writers, transforming something from words to pictures is an inherently difficult process and as editors we need to attempt to massage the fusion of the two into something that’s easily coherent. Sometimes things fall through the cracks. Those are the things that I want to talk about. Welcome back for another session of editorial edits. 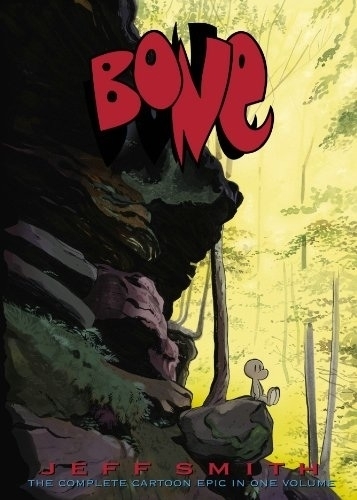 If you haven’t already gleaned from the title, this time we’ll be looking at pages from Jeff Smith’s magnificent magnus opum, Bone. 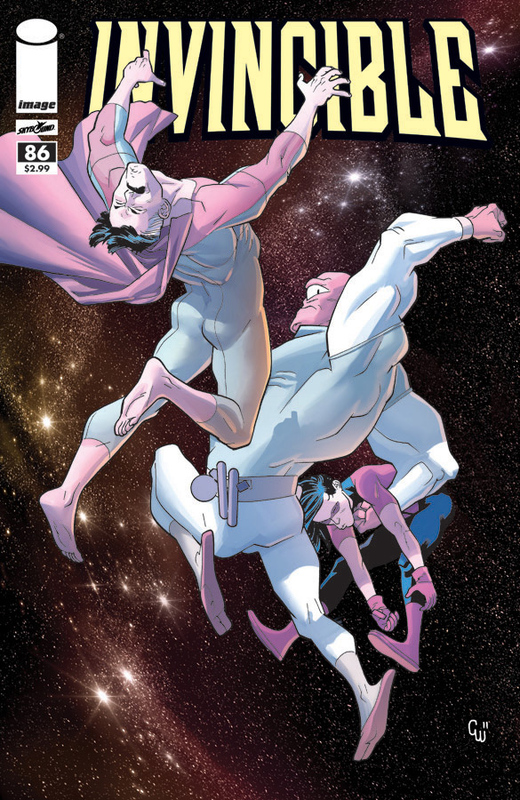 Jeff Smith should be a household name to any respectable comic book fan, but for those of you funny book neophytes out there, I’ll give you a quick synopsis of his work. As of right now he’s writing and drawing an amazing little black and white book called RASL that’s released quarterly. It’s far more adult-oriented than the often-times whimsical Bone, and it has a very gritty feel to it. The book focuses on a dimension jumping art thief, fictional physics, the work of Nickola Tesla, and alternate universes. It’s a great read and I suggest you pick it up if you’re interested. Before that he wrote and drew SHAZAM! 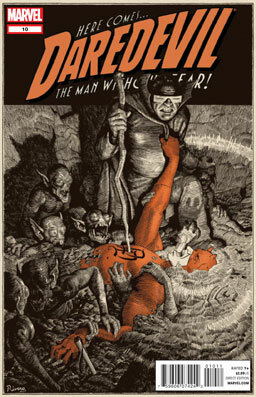 And the Monster Society of Evil for DC Comics, a revamp of my favorite DC hero, Captain Marvel. I will admit, my edit is a very very small one, barely noticeable even. However, I do think that it would enhance the strength of one particular page ever so slightly and thusly contribute to the book as a whole. This is the page that I would change. I would edit this page. I'll explain, don't worry. Can you spot what I would change? I’ll give you a tip: It’s in the top row. The page above is a riff on the six-panel grid layout. The bottom two rows are mirror images of each other in terms of panel size and possess a sort of symmetry. 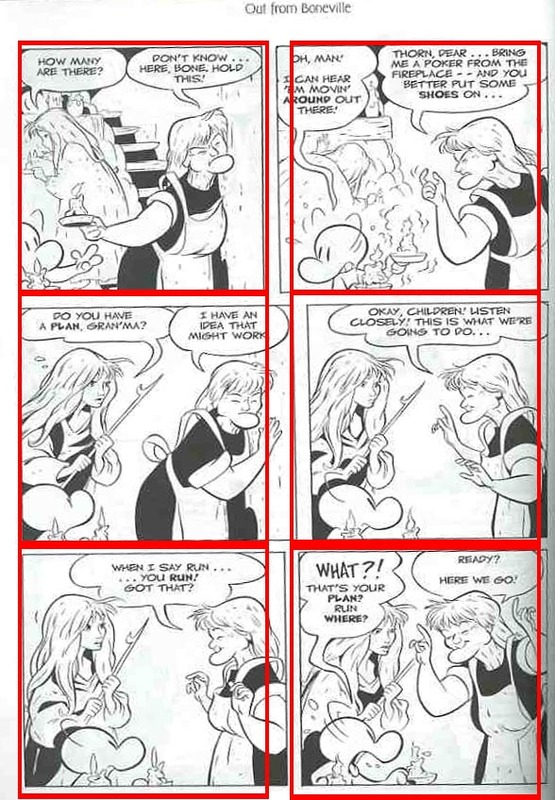 The top row has three panels, the 2nd and 3rd are connected loosely through the gutter by the imagined extension of Gran’ma Ben’s arms and the onomatopoeia at the top of the panels. 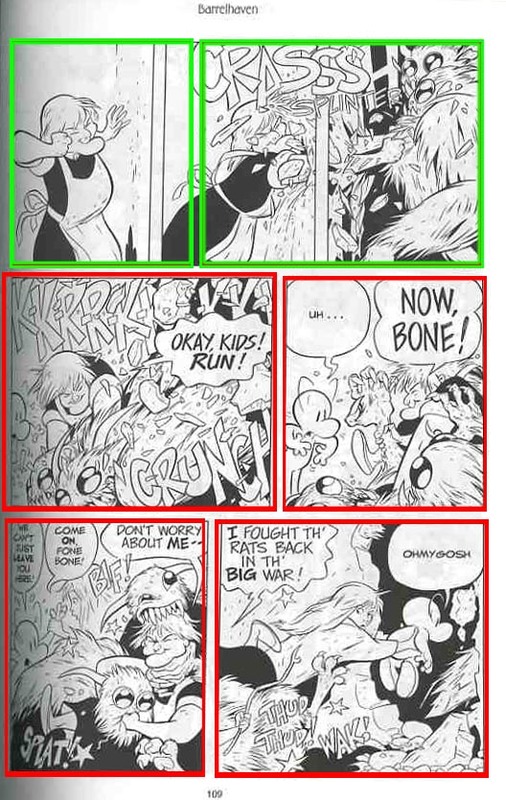 If I were Jeff Smith’s editor I would have proposed that he combine the 2nd and 3rd panels to make it a 6-panel page and physically connect panels that are as yet only connected in the reader’s mind. This would enhance the clarity, symmetry, and visual consistency of the sequence. Readers can see the Gran’ma Rose punching through the wall, but because the wall is flush against the panel border, it looks as though she’s punching through the gutter to grab the rat creatures. Because of that her arms seem outlandishly long for such a stout woman. Also, it looks like the panels are meant to be connected through the CRASH and SPLINTER sound effects stretching between them, but then why separate the panels in the first place? What purpose does that white gutter space serve? This is how I would have changed the page. My very slight change adds consistency and symmetry. And there you go, the page is symmetrical and the panels are connected (just go with it). I wonder if that gutter was something Jeff really wanted in the page? I would be really curious as to whether or not he thought it enhanced the page. Typically, reading comics is a breeze. Most people can pick up a book and dive right in. Sure, they might get bogged down in six decades or so of continuity or lose a touch of their sanity trying to understand some extremely complex plots, but the form, the style, and path of action, those should be clear as day. The reader should know what’s going on, even if they don’t understand why. The call for clarity is nearly always answered by the writer and the artist. 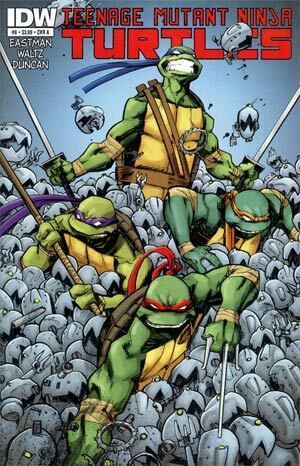 In all my years of reading comics there are but a few that I can honestly say I had trouble reading. That’s a testament to the skill of modern comic creators, but also to the editors who review, revise, and finally approve a finished comic. 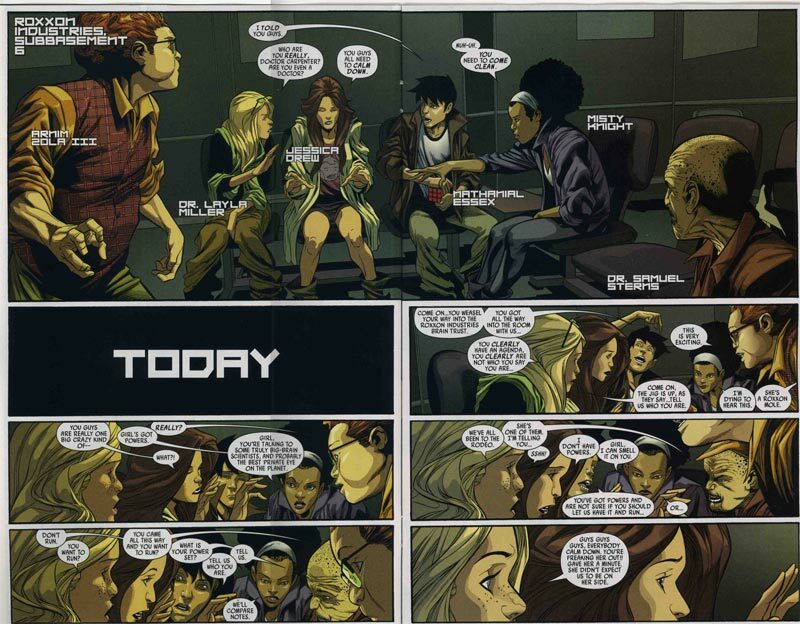 Instead of calling it a “Bendis Page” I’ve dubbed it a Top Spread Establishing Layout. 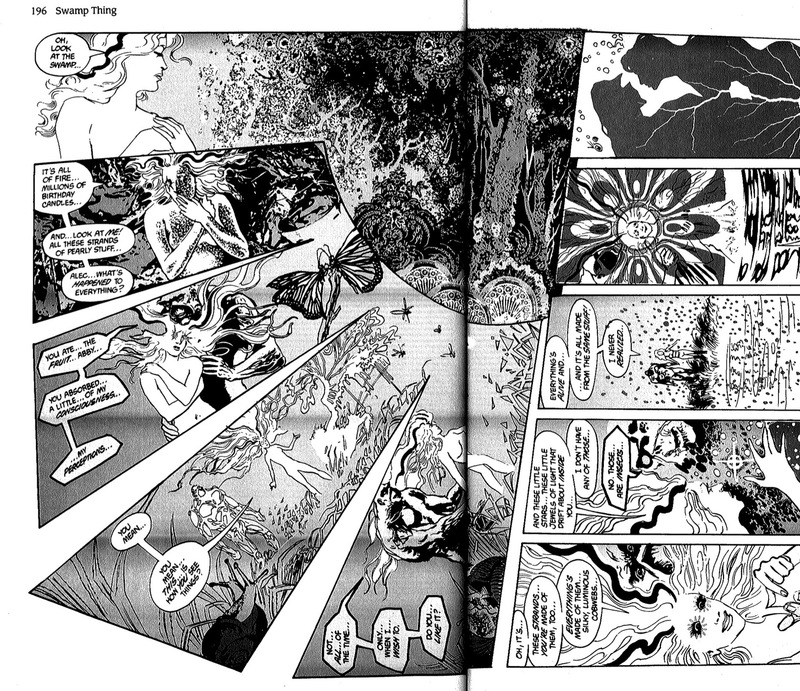 As you can see in this example it’s a two page spread in which the first panel controls the majority of the viewing space and is followed by three minor panels that run left to right along the bottom of the page. The green arrow is just to show you how you read it. Ok, so for me, this page was confusing. My uncertainty began at the “Today” panel. It became a question of “Do I read down as though it’s become a single page?” or “Do I read across as if it’s a 2 page spread?” Initially I had read it down, which, if you made the same mistake you learned that is the incorrect way to read it. However, even then there isn’t much to tip you off. Most of the dialogue could flow from one panel to the other in any order and the only visual clue that Sandoval gives you that the panels are read across is each shot zooms in a tiny bit with each subsequent panel. So many arrows and I didn’t even include arrows for when your eye would travel up! Even someone well versed in the ways of the funny books might get lost in that page. You actually read the page down, as though it’s 2 pages disregarding the top panel. As an editor I would have scrapped the tradition for doing this layout entirely. 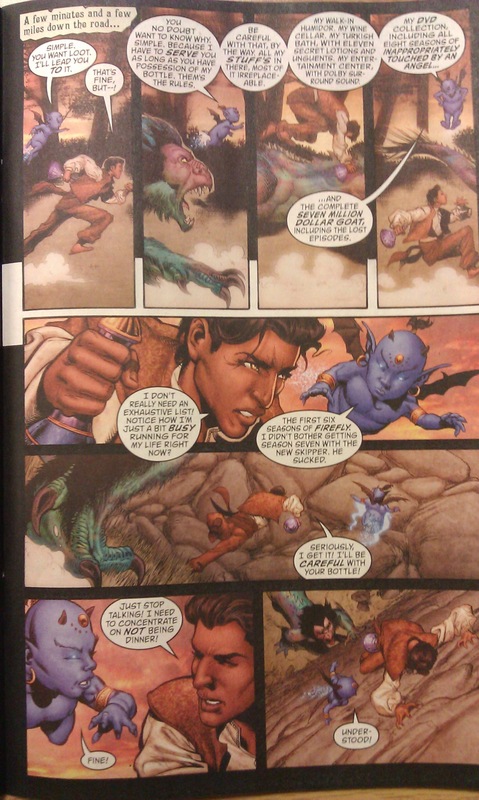 However, due to the confusion of the scene in general, the Sandman escaping Dian Belmont, everything is a mess. In comics clarity is king. If it doesn’t serve the story then it doesn’t belong. This layout, oftentimes, is just too confusing. However, this is just my editorial two cents. Feel free to agree or disagree or just comment period because I’m passionate about these little quirks and discussing comics theory… well that’s what I’m here to do!